Route 66 is 2,448 miles of highway covering eight states. 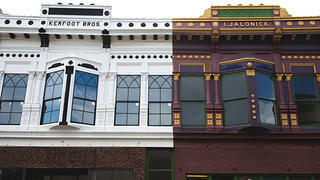 In its breadth, it captures a perfect slice of small-town America. On either side of the Mother Road are colorful diners, delightful foods and charming main streets. This winding highway is a source of connection for people, visitors and locals alike. So start the car. It's always a great time for a road trip and Route 66 has a lot to offer. 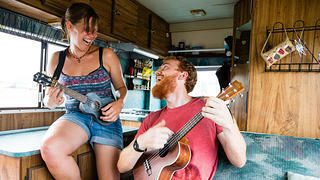 Travelers Natalie Rayner and William Barnett play the ukulele inside their RV in Illinois as they venture across the America’s Main Street. 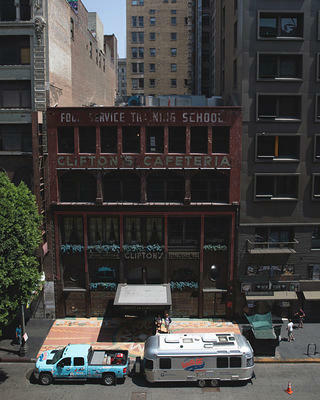 Opened in 1935, Clifton’s Republic in California is a gateway to a woodland paradise. Founder Clifford Clinton wanted everyone to have equal access to the restaurant and allowed customers to pay what they wanted. Listed in the Green Book, it was a haven for black travelers. This iconic Illinois attraction is the perfect spot for a colorful Instagram post. 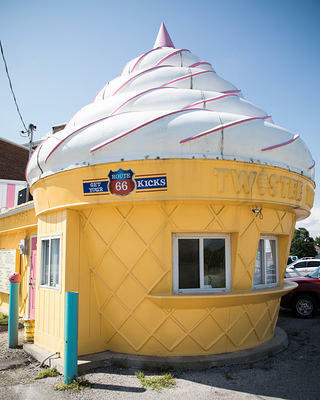 It is also an excellent place to satisfy your taste for ice cream—in a shop shaped like an ice cream cone. 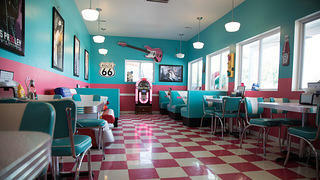 Hues of blues and pinks brighten the interior of the Twistee Treat Diner in Illinois. 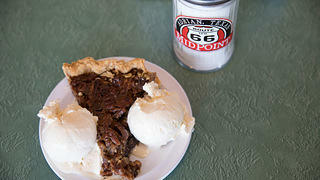 Built in 1928, the Midpoint café in Texas has been serving hungry travelers for over 90 years. At the height of Route 66 travel, it was open 24 hours a day. 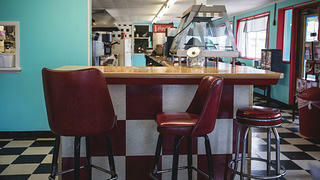 In business since 1955, Missouri’s Circle Inn Malt Shop is the definition of a family business. The Malt Shop has now been passed down to a third generation of the Ware family. 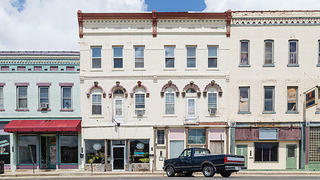 The town of Lincoln, Illinois, was officially named in late August 1853. It is the only town to name itself after the 16th president before Honest Abe even began his time in the White House. First opened in 1934, the Palms Grill Cafe in Illinois offers a slice of Americana—along with slices of their homemade coconut cream and pecan pies (among their many other desserts). In 1890, El Reno, Oklahoma, had a humble population of 285. Almost six decades later, at the peak of post war travel, the population had swelled to 10,991. Over 100 years of operation have made Missouri diner Caspar’s a haven for scrumptious Frito pies and world-famous chili. Head waitress Mercie Brown talks with Casper’s kitchen, taking orders for Route 66 travelers in the eclectic and colorful space. 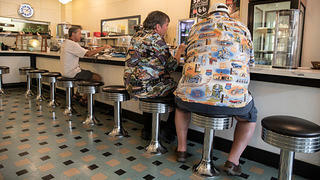 Doc’s Soda Fountain, opened as Deck’s Drug Store in 1884 in Illinois. 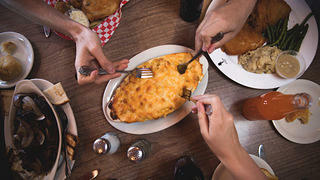 Today it serves a dose of nostalgia along with its old-fashioned sodas and lunch. Bill Deck stands in front of the Pharmacy Museum, a section with items dating back to the late 1800s. 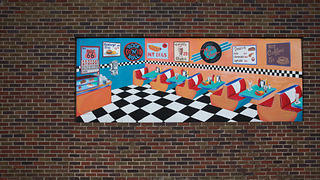 There’s no shortage of retro milkshakes and burgers at this Springfield, Missouri, Steak n’ Shake. 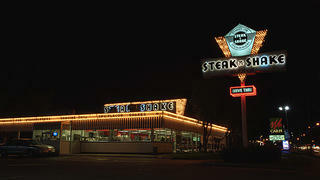 It officially opened its doors in 1962 and the lively neon sign has not dimmed since. Before 1927, McLean, Texas’ main export was oil and livestock via railroad. Route 66 transformed the charming town’s fixation from rail to road. In the late 1930s, two women overhead Irv Kolarik discussing increasing his sales. They offered to teach him how to fry chicken if he bought chickens from their farm. In 1946, the Chicken Basket in Illinois was born to meet the needs of travelers from the busy highway.